Rolling Dog Ranch is this amazing sanctuary in Blackfoot River Valley of western Montana. It is the one and only animal sanctuary of its kind--they cater to disabled pets. They have 60 animals right now, and 40 of them are blind. The couple that started Rolling Dog Ranch knew that animals with disabilities deserve a second chance too. Steve Smith, the cofounder, puts it this way: "They don't feel sorry for themselves. They don't want you to feel sorry for them. They just want a chance to get on with life and enjoy themselves." Sarah Ause, the staff photographer at Best Friends Animal Society recently made a visit up there and documented their work. Don't miss the amazing slideshow of her visit here. Be sure to read Sarah's full story that accompanies the slide show to learn more about pet blindness and the amazing hearts of the founders of Rolling Dog Ranch. 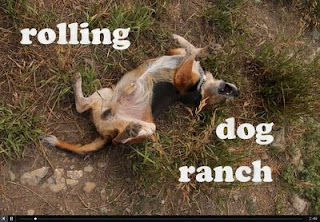 You can also read more about Rolling Dog Ranch, and offer your support, by visiting their website. 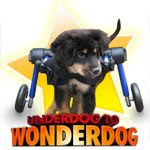 Animal Planet's Underdog to Wonderdog program got a call about a dog named Faith who was having trouble finding a home. Faith is a german shepherd/rottie pup that has limited use of her rear legs, but still managed to scoot around. Yet, her severe limitations made her a tough case for adoption, and in many circumstances, she would have been euthanized. This team was not going to give up on this girl. The team was able to get all kinds of help for Faith, including water therapy, where she amazingly learned how to stand on all fours on her own for short periods of time. Faith did a lot of hard work, and took agility classes and now gets along great with the help of a set of wheels, and has a home! Check out the adorable video about Faith on the Animal Planet website. (You have to watch a 30 second ad at the beginning of the video, but it is worth it). Wags to my friends at HandicappedPets.com for the tip! 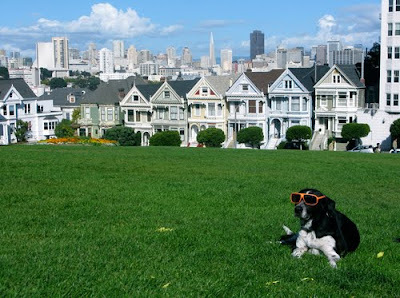 "bernie moved to san francisco because it was more “laid back” and “anti-consumerist” than new york, but still manages to drink two cups of starbucks a day"
Wags to my buddy Winn for keeping tabs on hipster dog culture! Sometimes humans have trouble communicating with their dogs. Who can blame them, not everyone speaks our language. Well, Ilga Cimbulis is a dog communication specialist. Along with her business partner and touch specialist Patti Anderson, the two help their owners understand dogspeak. Star Tribune columnist, Paul Levy recently took his destructive cocker spaniel pups, Sadie and Pearl in for an assesment. Turns out their destructive behavior was due to boredom, which is no surprise. But Cimbulis gave some more insight into their behavior: "They're bright, like little light bulbs; they've got way too much spirit and they know how to charm you and your wife." I know all about too much spirit--I was looking for my forver home for a long time before I found a human that could handle all of my spirit. My human is not a dog communication specialist, but she did jsut what Cimbulis recommended to Levy: provide structure and channel my energy into healthy outlets. This isn't rocket science to us dogs, but some humans need a little help figuring it out. As Cimbulis says, "We're focusing on the animals, but we're really training the humans. "Has you human ever enlisted the help of a communication specialist to understand you? Did it help? Tell me about it! Paul Fowler rescued Deiter and Bella after they lost their homes due to Hurricane Katrina. Life seemed mostly normal for a while. The Fowlers started a family, and later moved to Haiti to work in AIDS relief there. The four legged members of their pack went along for the family move. When faced with the disastrous earthquake in Haiti, the Fowlers took the dogs and their new baby on a terrible three-day trek to the U.S. Embassy. They were to be evacuated with other Americans, but were told they had to leave their dogs behind. A heart-wrenching decision, especially when you consider this had happened to these very same dogs just a few years ago. 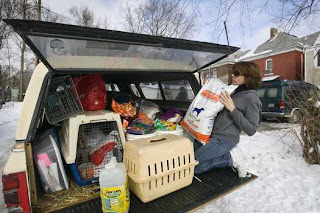 The Fowlers made it home safe, and shortly the Humane Society heard of their ordeal. Amazingly, the animal relief workers on the ground in the disaster zone were able to find and rescue Deiter and Bella! The pair flew into Miami to be reunited with their family. What a great end to a horrible ordeal. Be sure to check out the full story--here is the video and footage of the reunion. 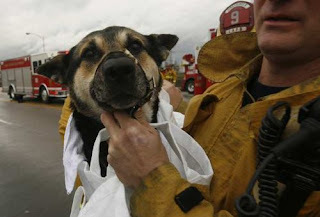 Kate Quigley is a real dog hero. Also known as "the dog lady" and "Miss Kate," she travels to high poverty neighborhoods in Kansas looking to help dogs in need. Kate talks to owners to improve their dogs' situations and delivers supplies and other help. Last year, she convinced 1,000 cat and dog owners to let her "borrow" their pets to have them spayed and neutered. She also gave away 95 doghouses and 14,700 pounds of dog food to families struggling to care for their pets properly. Kate says that a lot of the problem is ignorance, and she hopes to educate these pet owners on proper care for their pets. When she does encounter a dog in a really bad situation, she will contact the local animal control to intervene. But they are stretched thin like everyone else these days, so she does her best to improve on the dogs current situations. For example, when a dog is on a short chain tie-out, she works with the owners to understand why that is unhealthy and tries to work with them to use more humane cables and provide shelter for the dog. Kate started her own non-profit organization recently to support her work. According to the Kansas City Star, "Chain of Hope’s mission, she says, is to break the chain of ignorance for pet owners who neglect their outside dogs, to break the chain of unwanted litters, to literally break chains and padlocks off dogs, encouraging owners instead to use cable tie-outs that won’t embed themselves in a dog’s neck." I was not able to find a website for Chains of Hope...but if anyone has more info, let me know and I will link to Kate here on the Scoop. UPDATE: I heard from Miss Kate's daughter! She provided the following info: The website is in progress and should be up soon. it is www.chainofhopekc.org. In the meantime the contact info is: Chain of Hope, 258 W. 3rd Street, 1st floor, KCMO 64105. Click HERE for Chain of Hope's Facebook page. Click HERE for Chain of Hope's Petfinder page. Ranger was found last summer as a stray in Kansas, and won over the hearts of the shelter workers that he too came to love. But for no obvious reason, they had trouble placing him in a forever home locally. The clever folks at the shelter turned to facebook to help Ranger find a home. Kelli Cameron of St. Charles, Illinois came across the facebook update and knew she had to do something. Kelli already did some volunteer work with her local shelter, but something about Ranger made her feel like she needed to do more. She was trying to place Ranger through people that she knew, and gave regular updates to her husband about this far-away dog in need. Then he offered up a novel solution--that they bring Ranger into their family! The action that followed would have been impossible without the availability of internet networking. A muti-state web of dedicated dog lovers coordinated a flight though Pilots-n-Paws from Kansas, to Missouri, to Iowa, to Illinois. A sweet, sweet landing for Ranger was at the end of it all--with his new family and forever home. Training for the Olympics is hard work. Many of this year's athletes are lucky to have their pets around to support them. My friends over at Petside.com have compiled interviews and photos of this years American Winter Olympiads with their very special pets. 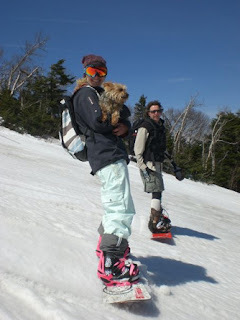 Snowboarder Lindsey Jacobellis has her Yorkie named Gidget (pictured here), but her love of pets doesn't stop there--she is also a spokesperson for the ASPCA, and hopes to open her home to another rescue dog after the winter games. Freestyle skier Pat Deenan has a barn-load of pets cheering him on--a horse, a donkey, a miniature donkey, two cats, and three dogs named Hershey, Crunchy, and Munchy. Petside.com has many more profiles and pictures--find out if your favorite athlete is a pet lover like you! All the more reason to cheer them on in the upcoming winter games. But their #1 fans are of the four legged variety. Don Callahan, 72, is sure lucky that he rescued Wyatt at an adoption fair at the local zoo. While Don, a former police dog handler, was walking 70-pound Wyatt on one of their twice daily walks he collapsed suddenly. Don was not visible from the road, but desperately needed help. Wyatt, a big dog, with a big bark, sounded the alarm. When someone called to report a nuisance dog, a patrol officer responded and discovered Don unconscious. It turns out he was nearly in a diabetic coma--and help came just in time. Don made it to the hospital and received the treatment he needed. Wyatt stayed with one of Don's friends while he was in the hospital...and was ready with wags and kissed when Don came home. The two are as inseparable as ever. Tillman was already a talented pooch as the world's fastest skatboarding dog. Well, what is a skateboarder to do in this weather? Snowboarding! 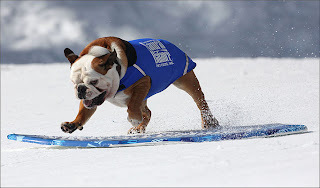 That's right, this bulldog has moved on to mastering some new skills on the snow. His has been training with two other bulldog buddies--Lyle and Rose. One of their trainers explained their natural talent: "Bulldogs have a low centre of gravity so learning to stand on the boards came very quickly and naturally for them." They each have different techniques though--Tillman loves to go fast, Lyle loves to cruise, and Rose adds tricks to her boardwork. The whole crew is traveling to the Winter Olympics next week to show off to their human counterparts--and do a little promo work for their sponsor--Natural Balance dog food. 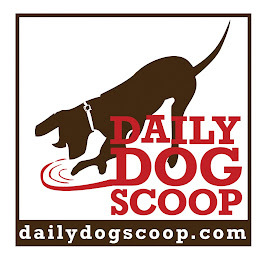 Be sure to check out the link above for video of these dogs in action. Dodger's first week of life was pretty hard. He was born with a deformed leg, and his humans decided to literally dump him. A good samaritan out walking his dog found the pup in a plastic bag near the dog park--and immediately took him to the local shelter. Now in foster care through the Ogden Animal Shelter, Dodger is doing well. He has received a lot of attention from the local press and the shelter received more than enough donations to cover his care, including the medically necessary amputation of his leg. He also has a forever home lined up once he is all healed up. The Black Dog Rescue Project, which has helped out the shelter with Dodger's case, reminds folks that there are plenty more black pups out there in need of homes. Black labs are the most common breed in Utah, where the shelter is located. Not popular enough though--as 11 new black dogs came into their care on the day this article was written. For video of Dodger, go here. Puppy Bowl VI this weekend! "Straight from shelters, this year’s starting lineup is filled with spunky spaniels, fierce French bulldogs and bustling beagles that are ready for action as they vie for the title of MVP (Most Valuable Puppy). 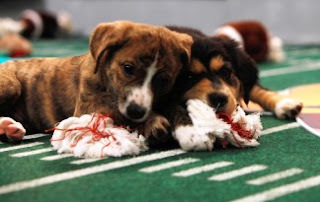 Puppy Bowl VI cameras catch all of the thrilling action as the puppies pounce and play, mimicking the rough-and-tumble moves of professional ballers. Our veteran Puppy Bowl referee, Andrew Schechter, will be on hand to keep the players in line and to dole out any necessary "puppy penalties." With instant replays, the popular water bowl camera and the addition of the blimp, viewers won’t miss any of the action on the field." There will also be a Kitty Half-Time Show, if you are into that kinda thing. It will be broadcast in HD on Animal Planet this Sunday at 3pm eastern time. A lot of people don't realize that us dogs do require some work. Why not start teaching them as kids? Well, the good folks at Morongo Basin Humane Society in Joshua Tree, California are working on teaching humans about dog responsibility at a young age. The shelter workers held a class on pet safety and care for a group of Onaga Elementary School fourth graders. 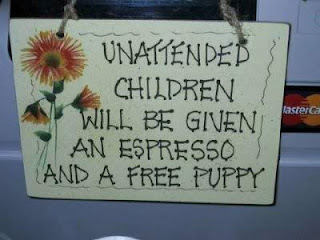 The kids learn how to behave safely around dogs and also how to be a responsible pet-parent. These kids are also learning about the needs of homeless pets. Several classes from the school are holding a supply drive for the shelter. The class that raises the most supplies will win a pizza party, but they should deserve wags and kisses from the shelter dogs they are helping out. Vernon (Spikey) reunites with his pack! Vernon was the subject of a dramatic water rescue in LA last week. Check out the video footage here. Well, he has been claimed by his human pack! Turns out they don't speak English, so missed the extensive television coverage of the rescue. A friend told them about all the TV coverage and they came in to animal control to claim the dog they know as Spikey. All of his tail wagging told the officers that this was his real family, but they did a little investigating just to make sure. LA Times has the whole story. Wags to my Facebook fan Donna for the tip! Be sure to stay connected to the conversation that all my followers are having on Facebook. Baltic w as lucky that a group of Polish researchers in the icy Baltic Sea floated past him on their boat. 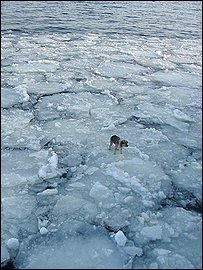 The poor guy somehow found himself stranded on an ice floe in the middle of the sea. After multiple close calls and many more attempts, the researchers were able to get close enough to pull him onto the boat by the scruff of his neck. They quickly got him dried off an wrapped in blankets to warm up. Before they knew it, he was looking to his new shipmates for a dinner and a little company! The researchers and Baltic are now in port at the city of Gdynia. Baltic was checked out by a veterinarian, and is surprisingly ok considering all he had been through. Now comes the task of figuring out who he belongs to. Four people have come forward claiming to own him, but Baltic said it wasn't so. The research team is ready to call him a full time shipmate if his former owner is not located soon. In the meantime, he is making himself at home on the ship. In fact, he is scheduled to set sail with them on February 10th.